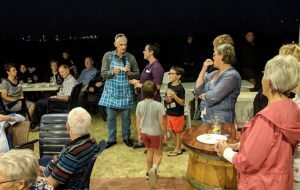 Rotarians had a fantastic time at the Presidents Barbecue at Koombana Bay Sailing Club Wednesday night 16th January. 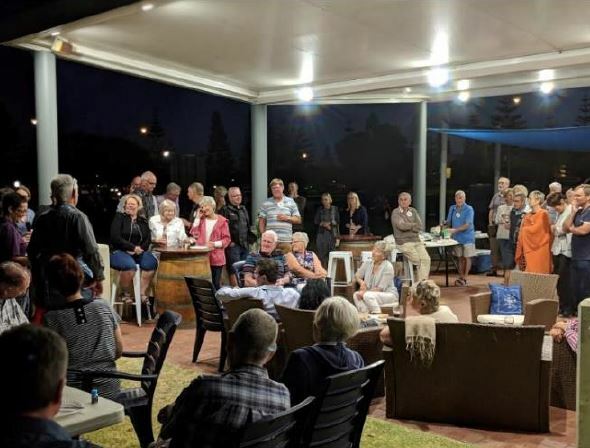 They invited their friends and family members, and rumour has it that approximately 100 people showed up to the barbecue…this must be a record. This is a real credit to Dawn, President Tony, and everyone who bought a guest. Rotarians enjoyed a delicious meal cooked by their President, Tony…that’s why they call it a Presidents BBQ. They enjoyed beautiful views of Koombana Bay. Rotarians even enjoyed Mayor Gary Brennan’s company and ‘well prepared’ speech. President Tony also gave a cheque to Courtney from Doors Wide Open. A little tip Tony – the photo would look more professional without the blue apron. However, Courtney must have been very appreciative towards the club for the cheque, and the excellent time she had at the 2018 Dirt n Dust.